This 3-by-3 mosaic consists of pieces of stone bonded to a fabric. Hallack purchased the mosaic at a Home Depot in Mexico. It serves as the focal point of the MedAmerica Billing Services lobby and is the only thing on the floor not made of concrete. MedAmerica Billing Services Inc. in Modesto tasked the president and CEO of Concrete by Hallack in Turlock, Calif., with the job. The company, which has more than 600 employees, provides coding, billing, auditing, accounts receivable management and reporting services to more than 60 client firms involved with hospitals, emergency medicine, wound care, physical therapy, skilled nursing facilities and family practices. "This company is huge," Hallack says, and the renovated area is always teeming with people. "Management thought it was time to replace the gray look you find all over America with something more modern-looking. They wasnted something that would make people take notice, something that would make them say, 'Wow, where am I? This can't be a billing office.'" And it couldn't just look good. It had to wear well, since traffic was not expected to slow. After visiting Hallack's showroom, board members were sold on the upscale look of his decorative concrete samples. They chose to go with a Matcrete seamless-skin overlay stamp. Hallack was in charge of selecting the color combination and placing saw cuts, besides actually placing and stamping the overlay. A picture of the lobby prior to renovation. The focal point of the renovated MedAmerica Billing Services lobby is a mosaic. The focal point of the area's design is a mosaic that Hallack found at a Home Depot in Mexico. The 3-by-3 mosaic consists of pieces of stone bonded to a fabric. "I was down there doing training for a museum named MUSAS being built and I was shopping for some supplies. That's when I saw these mosaics and fell in love with these amazing pieces of artwork," he says. He bought a few in different styles and brought them back to California. 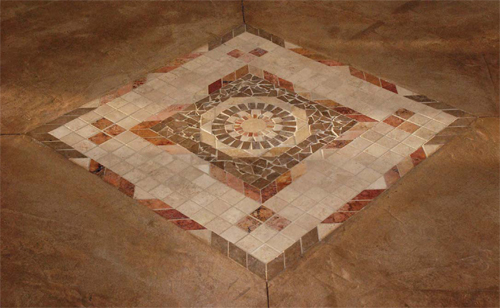 He asked his MedAmerica clients if they would be interested in using one of the mosaics as the center of the new design, which he would color-coordinate to match the rest of the project. They liked the idea but thought the idea of a mosaic sounded pricey - until Hallack reassured them. "I told them I would only charge them $500 more as my gift to them," Hallack says. "I wanted to use the combination of that mosaic with products we normally use to show people everything is possible when you have a client that allows you to play with your skills and breathe life into a vision." Matching the colors was very simple, Hallack continues. "Miracote has many excellent choices." His crew used Miracote's water-based Mirastain II colored Sandpiper Beige as the base, then applied Mirastain colored Adobe. A dark brown grout was used for dramatic contrast and because the client was nervous about dirt getting trapped in the floor's crevices and showing over time. The floor was sealed with three coats of Mirapoxy WB, a breathable, chemically resistant, water-based epoxy coating. The mosaic was grouted in where foot traffic from four entranceways converge in the lobby. "It had to be laid right on center because it can be seen from four different directions," Hallack says. Dark brown 2-by-2 diamond-shaped areas spaced down each corridor accent the mosaic. To the untrained eye they look like pieces of tile, but, of course, they aren't. "The only thing not concrete (on the floor) is the mosaic," he says. "That's the excitement I got from this job - fooling people at a very good price." The front desk was the job’s crowning jewel, according to Julio Hallack. To achieve the transformation, Hallack says, he had to protect the rest of the building. "We had to be very careful not to invade other areas of work," he says, as the company was open for business as usual during the renovation. "The plastic was up the whole time and we had to vacuum a lot to keep the dust to a minimum." Cracks were another obstacle he had to overcome. "There were a ton of cracks on the existing floor," Hallack says. To repair them, he and his team placed a special rubberized fabric membrane, and another fabric on top of that, before covering the entire surface with Miracote Mirastamp overlay, a two-component cementitious, thin-stamped overlay with high compression strength that's well-suited for continual pedestrian traffic. The chosen finish involved a very soft stamp on the overlay and no deep saw cuts. Since everything was under wraps for two weeks, the end result was a big surprise, Hallack says. "It was pleasing to management and staff alike." Although the mosaic-inspired floor design turned out awesome, Hallack says the transformed 29-foot-long laminate counter was the job's crowning jewel. "The management asked if anything could be done with the existing counter, since the painting contractor felt that paint was not the right product and replacing it was very expensive. I recommended Miracote Micro-Topping with a smooth finish," he says. First, Hallack says he had to profile the counter's laminate surface before applying a self-adhesive fabric. 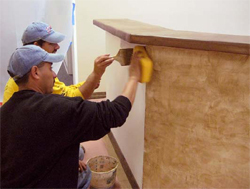 He next applied Miracote MPC Micro-Topping in a four-step process that involved sanding out imperfections in between coats to build up a smooth cementitious layer. He acid-stained the top of the counter Dark Walnut and applied Adobe Mirastain II with a sponge to accent the sides. The whole thing was sealed with Mirapoxy, an epoxy system typically used on floors. To pull it all together, the drawers were dressed with 12-by-12-inch clay tiles, and new baseboards were stained dark walnut. "The fact that we introduced a new technology (to the client) on the existing laminate counter was the aspect of the job I was most proud of," Hallack says. "The high-quality sealer will serve the company well." People will be leaning up against the counter and shuffling papers and packages across it all the time, he notes, and he thinks it will hold up. 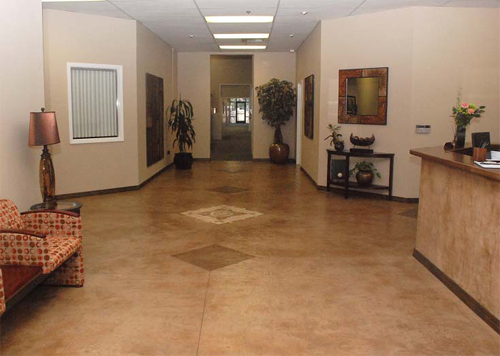 Scope of project: Renovate a 1,500-square-foot "mail lobby," which involved removing the existing 12-by-12-inch ceramic tile and carpet, replacing it with a 1/2-inch stampable overlay and refurbishing the existing laminate counter, all while the company was still open for business.